I decided to try out the “blender-style” of making pancakes this morning and LOVE it. This is great for those who don’t have a grain mill, but want to use whole grain berries to make their own flour. This is an easy way to do it without a grain mill. I got this idea from Lindsay @ Passionate Homemaking, whom she got from Sue Gregg. I am very interested in getting a couple of Sue Gregg’s cookbooks, maybe someday! Anyway, I decided to use brown rice and millet for two reasons… one, I wanted to try some gluten-free pancakes and… two, because my mom is very sensitive to wheat. You can use this with any kind of raw whole grain (kamut, spelt, oats, etc..) and blend it with cultured dairy or alternative acid medium. Then “soak” it overnight and blend it in the morning with the rest of the ingredients. I decided to add a little more grain than what the recipe called for and used an alternative acid medium. My mom was over-the-top excited to try these pancakes out and LOVED them. It came out crispy and chewy, with a slight grainy texture and mild earthy flavor. These gluten-free & dairy-free pancakes tastes great simply with honey or maple syrup. You can also make this egg-free by omitting the egg… so altogether this can be a vegan gluten-free breakfast treat! 1 1/2 cups water w/ 2 Tbsp. apple cider vinegar or lemon juice. Combine the ingredients above in your blender and blend for 3 minutes if using whole grains or 1 minute if using flour (if you are using flour, you might just want to mix it in a bowl). Cover and allow to sit for 12-24 hours. In the morning, add the following ingredients and blend for a minute more. 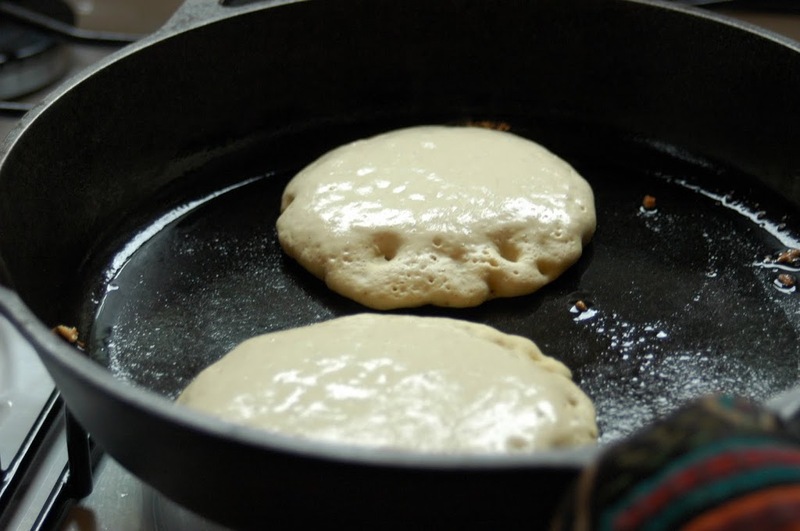 Prepare the pancakes on a warmed, lightly greased cast-iron griddle. This recipe makes about 15 or more pancakes. Have a great morning making these! « Spicy Sweet Find: Fresh Ginger!! 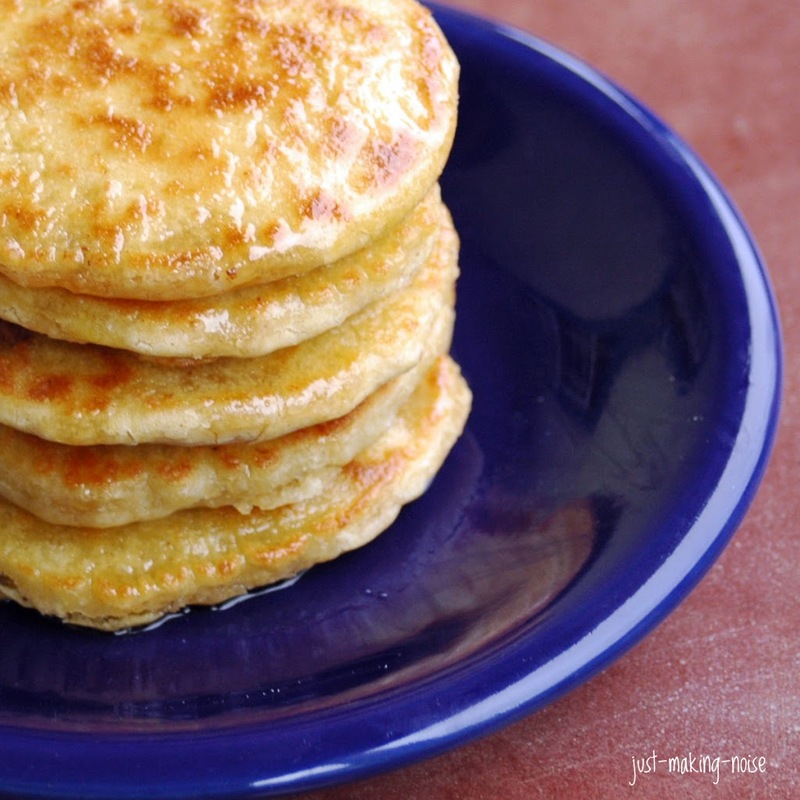 I need to try these out, those pancakes make such a hearty and healthy breakfast! I’ve “ground” buckwheat and millet (and oat meal) into flour in my little coffee grinder, but I wouldn’t have thought the hard grains like rice would blend up at all… Now I’ll have to try it sometime. I’ve been soaking my grains overnight, having a raw-grain cereal in the morning. But this sounds like a special treat- I’m excited to try it. Thanks, Mare! Oh, where were you when I took dairy and eggs out of my diet while nursing an allergic baby? These would have been my go-to every morning. Hey, I am still interested in them, as we love pancakes around here and a new version would help keep us from getting bored with our current recipe! Plus, I love the idea of all the grains (I usually add ground flaxseed and pureed sweet potato to our morning batches.) They look so golden and appealing. Can’t wait to try! These pancakes sound delicious! I have never tried the blender-style pancakes before, but it sounds like fun. I will have to give it a try! Did you use a particular brown rice – long or short? Divina – I used brown jasmin rice, but you can use any kind of brown rice. I was so excited about these but my cakes stuck to the well-oiled pan and turned to crumbs! I started out on medium heat and was on minimum by the end but still no luck 🙁 Any suggestions? Michelle- what kind of pan are you using? I used a cast-iron… sometimes that makes a big difference. Another thing is you want to get your pan HOT before pour the batter… then turn down the heat if needed to prevent smoking. Hope it helps! Delicious, and my 8 month old loves them (she’s a baby led weaner). Even my husband, somewhat reluctant when it comes to whole/natural foods, had to admit they were good! Can’t wait to try more of your recipes. Terrific site, keep up the great work! Just to clarify that you used the whole grain rice and millet as opposed to already ground flour, right? 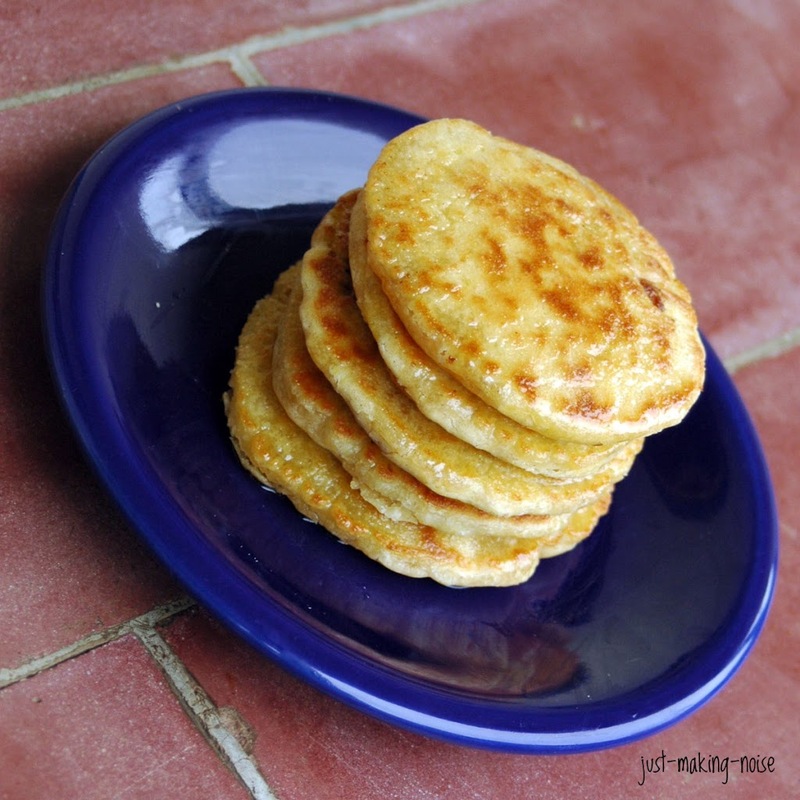 Speedmum – yes, I use whole grain.. you can use ground flour too. Just wanted to check back in and report success using an electric skillet!! I also discovered that GF pancakes really do need more cooking time–I was flipping too soon, as you would with wheat pancakes when bubbles appear. Hello! The only thing I can think of is did you wash the millet beforehand??? Millet naturally has a layer of seal or something that can be bitter and needs to be washed out. I realized that I didn’t mention that above. I’ve never noticed a bitter taste in my pancakes. Hope this helps!!!! Ok I soaked them with yogurt instead of ACV like i was doing and it worked!! 🙂 thanks for your reply! I just did the first step, and there are still chunks of rice about a millimeter long (they were not ground into a flour). Is this going to cause the recipe to fail? I blended for over three minutes but I just have a cheap Osterizer blender. I don’t think it will fail, but will have a crunchy texture. How old is your blender? It could be that your blades are dull. Have you tried sharpening them? You can always blend them again in the morning because the soaking process will soften the grains. Wow these were amazing!! Didnt turn out crunchy but were sorta chewy, in a GOOD way!! Very addicting! Even good cold with honey on them. The taste reminds me of something familiar and delicious…but I can’t recall what. I love your blog and I love this recipe. I think I’m going to make this for our new years breakfast. Thanks for being awesome! Can’t wait to keep looking thro your site. It rocks! looks awesome! not really into gluten free here but my dad is celiac so i’m always checking out new gluten free stuff for him. 🙂 i’m much pickier than him so if it gets my approval then it almost definitely will him. gonna get some millet this weekend and try this one! wondering though, i noticed u used acv but mention cultured dairy as well, is there specific cultured dairy that works best? my kids and i really dont like the taste of keifer but i’m assuming that store bought yogurt isnt what u mean? i typically buy stuff like the activia or greek yogurt that our local target sells, would those work? Greek yogurt should work fine as long as the cultures are alive. I’ve never tried store-bought.. so you can try it and find out! I noticed that more people like the taste of the pancakes when they are soaked in cultured dairy. Hope you and your Dad will like them! We sure do!! I didn’t have enough brown rice so I used 1/4 c brown rice and 3/4 c wild rice. Really yummy! I love how fluffy this pancake is, and I don’t have to use xanthan gum. that does sound good! So glad you enjoyed it Krista! I’m not sure if WHITE basmati rice will work. You can use BROWN basmati rice. Brown rice and white rice have different structures.